Harlequin Butterfly Bush is a surprisingly beautiful sport of Royal Red Butterfly Bush. Like Royal Red, it is a smaller butterfly bush that only gets about 5 feet. Because Harlequin Butterfly Bush is a sport and not a true variety, instead of cream and green leaves it will occasionally grow some stems with only solid green leaves as it tries to revert back to Royal Red. These should be cut off when spotted so the bush maintains its variegated characteristics. This plant is sometimes available in plug trays. These trays hold 128 of all the same plant. They are a great low cost way to fill a lot of space. Each cell is 3/4 of inch by an inch. Check here to see if Harlequin Butterfly Bush Plug Trays are available. 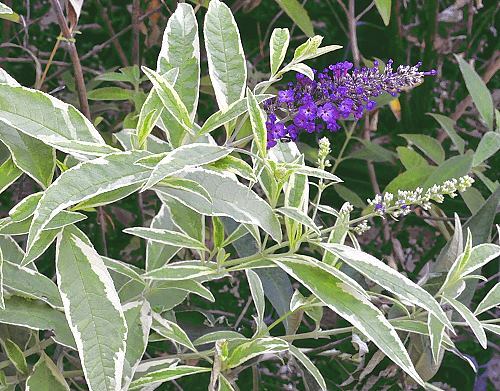 Harlequin Butterfly Bush makes a great addition to our Wildlife Herb Garden Six Pack.